Okay, I lied. I didn’t really meet Luciano Pavarotti, the greatest tenor of our time, but one of my very best friends did. And so I asked her to write down her story (because it’s a rare one), and share it with all of you. Those of you who are familiar with my debut album, Key of Sea, know that there is a song on there called O Mio Babbino Caro. I realize that it is a huge contrast in style compared to the rest of the songs on the album, but the reason it found its way onto the CD is because even though I am a pianist, I am a lover of good vocal music. 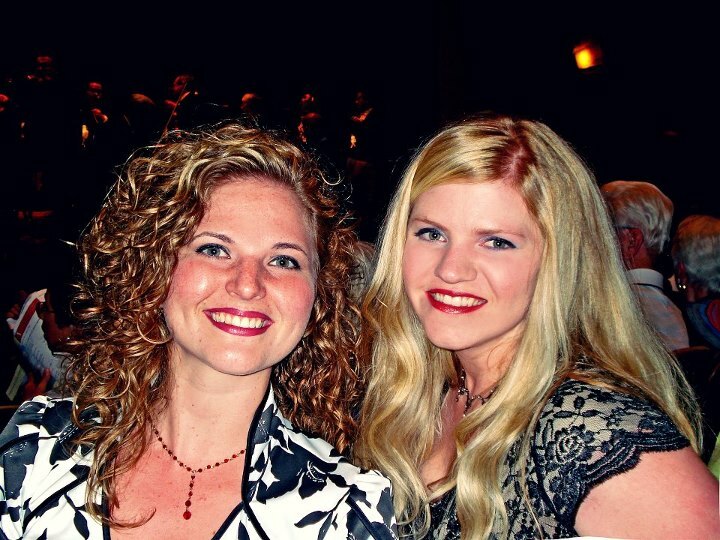 The vocalist who sang on that song from my album, Erika Nisbet, is one of my very closest friends. I didn’t ask her to sing on the album because she was my friend though, but because she is one of the most talented opera singers I know. If you could only hear her sing some of Mozart’s Arias, you would think you were floating on some magical cloud in a musical heaven. This is Erika’s story of how she got to meet Pavarotti (twice) and sit on his knee. I’m not joking. My friend Jennifer decided to share stories of famous people she met and asked if I would share a special story with you. It was a one in a million chance meeting. I graduated from the University of Washington in 2005 with a degree in Vocal Performance. In the spring I auditioned for a Young Artist program to take place in Oregon, which I attended. It was there where I met a very special, well known and talented lady by the name of Cynthia Lawrence. 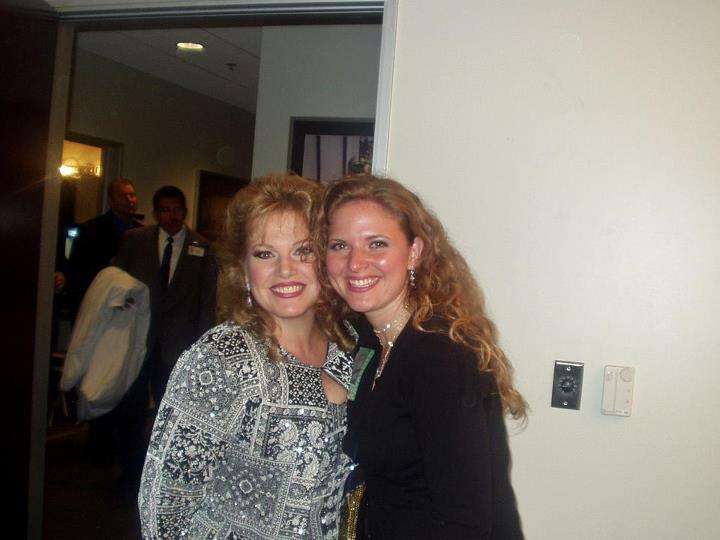 She used to perform around the country as one of “The Three Sopranos” in the 90’s and around the world with other world famous performers (soon to be revealed), and has a resume that almost all performers would kill to have. But, as you will see, she isn’t even the most famous person I have met. I worked very hard that summer in the program and each of the performers were given time with different coaches. Fortunately, I was given time to work with Cynthia on a one-on-one basis. I had a breakthrough at that lesson and it became one of the most inspirational experiences I have had in music. We formed a special connection and friendship that day. After the program was over, I kept in contact with Cynthia and she invited me out to Los Angeles for a lesson. Little did I know how that lesson would change my life forever. So I hopped on a plane to So. Cal excited for this great opportunity to work with one of the premier sopranos in opera once more. The day of my lesson, she was rehearsing at the Disney Music Hall, and she informed me that there was someone else rehearsing that day as well – the world renowned Luciano Pavarotti. I was excited, nervous, and could not believe my luck. After she finished with her rehearsal, she approached me and the rest of her entourage and asked if any of us would like to meet him. OF COURSE!!!!! Nobody had to ask me twice. Everyone else had met him on several occasions and insisted that I go alone. Cynthia gave me special instructions to follow after his rehearsal: “When he is done, he moves quickly off stage so if you want to meet him, I will tell you when to move and you will need to quickly come down to the stage to meet him.” Duh! I would have ran a sprint if she asked. The time came and I moved very quickly and we ran backstage to catch him. There he was in a scooter from the Scooter Store. Not really, but I thought I would try to be funny. He had a double hip replacement several months back and that was why he was scootin’ around. As he let go of my hand I was still a little frozen and excited and numb… his hand left and impression burned into my mind forever. His hand was so soft yet commanding – not strong and overpowering, but not weak and frail – it seemed just right and fit him well. It was a moment that very few people ever get the chance to experience, to meet someone who is a house-hold name all over the world. And to this day I can still imagine what that man’s hand feels like as he shook my hand. If you think that this is the end of my story, I have a surprise, it’s not. It was an impressive event, but there is more. After rehearsal, Cynthia and I did our lesson, and it was the worst lesson I had ever had. I think a combination of travel and being star struck by meeting the great Pavarotti ruined my true intention for the trip. But not one regret! Anyway, after the lesson we talked and she asked if I would like to come to the performance the next night at the Hollywood Bowl. OFCOURSE!!!!! Only a fool would have said no. The next night came and I got dressed up in my best travel apparel. A black rayon skirt from The Dress Barn and a stretchy leotard type shirt (not sure where I got it. Target? I don’t know…) along with my graduation jewelry from my Mother-in-Law. The jewelry was definitely the most expensive thing on my body and my outfit cost less than $50 maybe $40. (Like it really matters) But I didn’t think it was going to be anything more than the typical comp tickets that a performer gives to their family and friends. In my case usually the back row or up in the nose bleeds. Just to give you a little idea of who was there, behind me was Tracey Ullman with an up and coming Tenor, and next to them was Cynthia Lawrence’s friends. Next to me were the cutest old ladies and I wish I could tell you their names, but I was asked to sign a confidentiality agreement. Just kidding! There were a lot of people I recognized, but I couldn’t tell you their names. I almost ran into Cloris Leachman and in front of me off to my right was Garry Marshall. I took pictures with my razor phone. 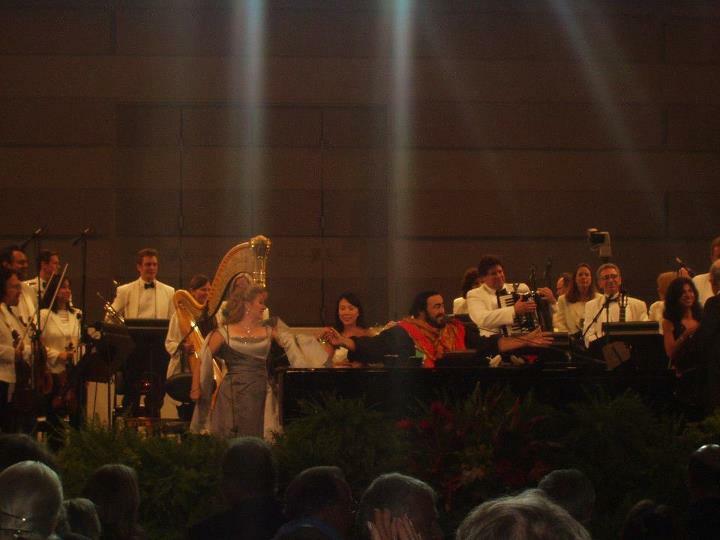 The performance was amazing and to know that I was there on Pavarotti’s Farewell Tour couldn’t have been better. Again, what luck! 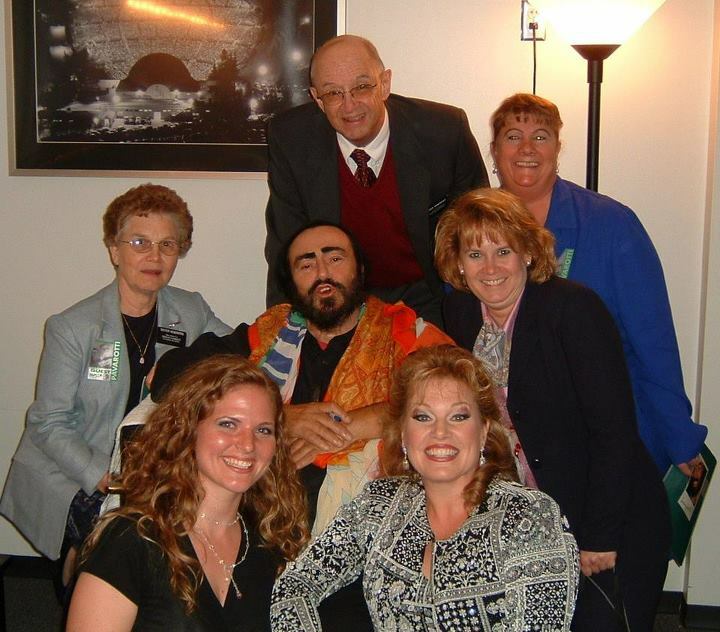 We went back stage and stood in line with Cynthia Lawrence to meet Mr. Pavarotti again. In front of us, his nephew and his nephew’s girlfriend got pictures with Pavarotti. We waited for a short period of time, and soon we were escorted into the room where the most famous man sat. There we stood in that room while he sat in a chair wearing his famous black shirt and colorful scarf around his neck. Cynthia asked if we could have a picture and he agreed as his PR guy said it was the last picture for the night. He looked at Cynthia and asked where her student was and she turned his attention to me. He smiled and said, in his Italian voice, “Why don’t you come sit down here” pointing to his right knee. I heard he was a little bit of a charmer with women. I thought that he was a little bit of a dirty old man myself, but in a really sweet way. We took the picture and we all stood up. He said a couple of things and I finally got my voice back, so I asked a few questions. I don’t remember what I asked but it seemed like hours later when he finally finished talking. And I don’t remember what he said, but I do remember he started telling us stories of himself and his experiences. It wasn’t long after my chance meeting with Pavarotti that I heard the solemn news that this super star performer had passed on. The fact that I had met this great man really affected me and made me realize it was a really lucky opportunity. Some would think after an experience like that, I would have been destined to do great things. I was! I am a stay at home mom who does a little data entry in the morning and sings daily to my boys. It’s the most challenging job and the most exciting job. And the memory of meeting one of the most famous people in the world before he died, is just that… a sweet, wonderful memory.